We’ve been making scones quite a bit lately. 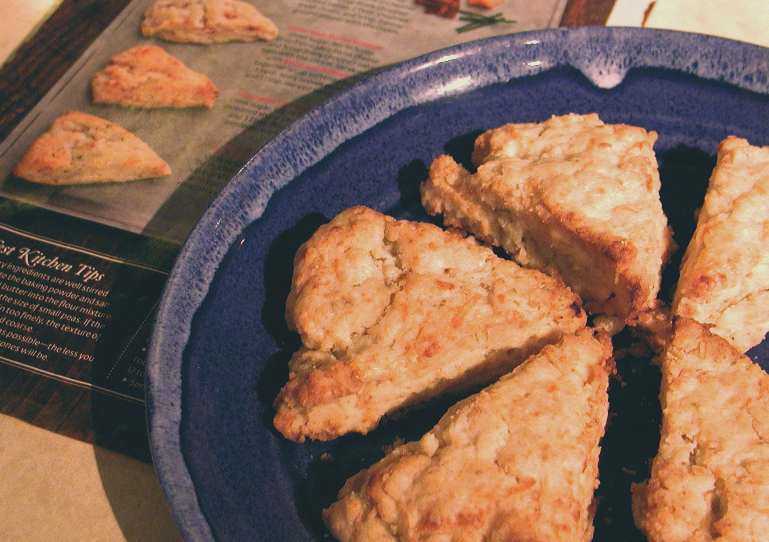 For some reason, we had put them in the “they’re a bit complicated, so save them for special occasions” baking category, but once we started delving into different recipes for scones, we found they aren’t much of a challenge at all. Who knew!? Stir together sifted flour, brown sugar, baking powder and salt in a large bowl. Cut butter into small cubes and mix into the dry ingredients (clean hands work well if you don’t have a pastry mixer). You want the mixture to look crumbly, like small peas. If you mix it too much, the scones will be too dense. Take out of the freezer and add 3/4 cup + 2 Tbsp whipping cream and pecans to the mixture, stirring just until the mixture is moistened. Cut each half into eight wedges (so you’ll have 16 mini’s) and place on baking sheet. Brush the remaining whipping cream over the scones. To mix things up a little, try a savory version of these scones — omit the brown sugar and pecans, stir in 1 cup of chopped pear, 1/2 cup grated Asiago cheese and 1 tsp of chopped fresh or crushed dried rosemary with the whipping cream to make Asiago Pear and Rosemary Scones (that’s the version we made in the photo above).